The summer festival season has begun in earnest, which means that you likely will find yourself traveling to some picturesque destination or other to hear music over the next several weeks. Of course, you’ll need something to listen to during your journey. So consider filling your car stereo or headphones with some of these new offerings from local artists. Engebreth and D’Amato have excavated from Thomson’s papers at Yale a wealth of unpublished works, including discoveries both modest (a series of lullabies for the children of Thomson’s friends) and far-reaching (the 12-minute “Oraison funèbre de Henriette-Marie de France”). The composer’s melodic ingenuity and paramount concern with clear prosody shine through every moment of this revealing set, thanks to the efforts of Engebreth and D’Amato and their colleagues (soprano Sarah Pelletier, alto Lynne McMurtry, tenor William Hite, pianist Linda Osborn, and, in a brief appearance, percussionist John McDonald). Complete texts and an insightful essay from Boston University’s Rodney Lister make this collection something to return to often — perhaps in the company of the Library of America’s collections of Thomson’s music writings, the second of which is due in August. Among Thomson’s best-known students is Scott Wheeler, a composer best known for his operas “Democracy: An American Comedy” and “The Construction of Boston.” This fall will see the premiere of “Naga,” his contribution to the “Ouroboros” opera trilogy on librettos by Cerise Lim Jacobs. In contrast to those large-scale creations, “Portraits and Tributes,” a new album of his piano music by Donald Berman on Bridge Records, has an enjoyably miscellaneous feel. 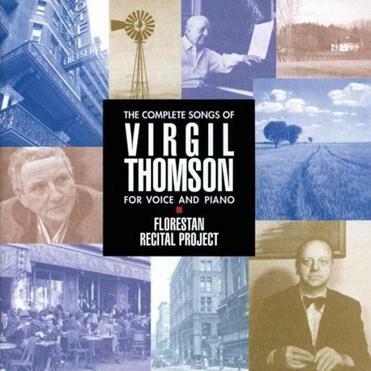 Wheeler writes in the liner notes that like Thomson did, he uses the piano “as a sketch pad,” a place to test out ideas or draft musical likenesses of friends and colleagues. Those so depicted include the composers Gunther Schuller and Arthur Berger, the biographer Megan Marshall, and the physician and visual artist Peter Stringham, among many others. The music offers a stream of fresh and inventive ideas, with hints of minimalism and ragtime. Everything is played with a light, deft touch by Berman, longtime pianist of Dinosaur Annex, the new-music ensemble Wheeler co-founded in 1975. The Boston Symphony Orchestra has grabbed headlines with its ongoing Shostakovich series on Deutsche Grammophon, the latest volume of which was released in May. Not to be outdone, the Boston Symphony Chamber Players have released a new recording of their own on the orchestra’s BSO Classics label. Brahms’s D-major Serenade and Dvorak’s Serenade for Strings are both offered in chamber arrangements (the former by Alan Boustead, the latter by Nicholas Ingman). Despite the reduced instrumentation, the BSO’s first-desk players and a few cohorts play with a unanimity and polish that make it strangely easy to forget this music was originally written for larger forces. That’s especially the case in the Dvorak, where Randall Hodgkinson’s piano gives the music a welcome splash of intensity. Ludovico Ensemble has served as a muse to any number of local composers. The group’s newest release — available on disc via CD Baby (www.cdbaby.com/ludovicoensemble) and for download on Bandcamp (ludovicoensemble.bandcamp.com) — is “I Might Be Wrong,” a set of chamber pieces by Cambridge-based Mischa Salkind-Pearl. Several of his works revolve around questions involving the interaction of humans and nature; here, that’s the case with “In” (2011), for which four percussionists surround a flutist in a way that evokes a solitary individual amid a broad, outdoor space. The title work (2012) deals with artistic uncertainty, which Salkind-Pearl subtly conveys in a series of short chapters that question more than they answer, often trailing off on the way to resolution. Something similar is true of the open-ended “Where I’m Likely to Find It” (2012) for solo violin, inspired by the Haruki Murakami story of the same name. Composing, Salkind-Pearl writes, “sometimes gives me the feeling that I am trying to uncover something lost, without even knowing what or where.” Yet the pursuits, as this engrossing collection shows, are still very much worth following.